Alright, so Francisco and Jose (proabably) won't become as storied as those other pairs of teammates, but don't sleep on how good they've been. They're posting numbers few duos ever have, even before taking into account their defensive positions. With Lindor at shortstop and Ramirez at third base, this year's Indians may have the best left side of the infield in baseball history. Seriously. The world is a very tribal place, and there are opinions you're supposed to hold because your side has agreed to them. Within the segment of the baseball community I tend to run with, one of those opinions is that Edgar Martinez belongs in the Hall of Fame, and it's understandable, because he was a tremendous hitter. The argument against Martinez is that because he was a designated hitter most of his career, his offensive numbers should be discounted. "He only played half the game." Early in his candidacy, Martinez's support was modest, and as recently as 2015 he received only 27.0% of the vote, That number rose to 43.4% a year later though, and then to 58.6% last year. Martinez currently has 81.0% of the known votes for this year (available via Ryan Thibodaux's HOF tracker), and while that figure may dip below 75% when the final total are announced next week, if it does he'd be a lock to get in next year. Edgar's supporters have won. What I'm wondering is, if Martinez belongs because he was that good a hitter, why not Gary Sheffield, who was every bit as great at the plate? On December 3, 2007, my dad turned 56. That evening he, my stepmom, a couple others, and I had dinner at their place. My stepmom was a wonderful cook, but I don't remember what we ate. I know that we had warm, enjoyable conversations, but I don't remember what any of them they were about. If I knew what I know now, I'd have made note of what had for dessert. I'd have catalogued everything we discussed, everything my dad said. I'd have chosen my own words deliberately and with great care. But I didn't know. I didn't know how busy I was going be during the next week, finishing up papers and projects at the end of my first semester of graduate school. I didn't know that after two years relatively fairly gradual changes, my dad's condition was about to decline rapidly. I didn't know that dinner would be the last meal we ever ate together. I didn't know that conversation would be the last we ever had. 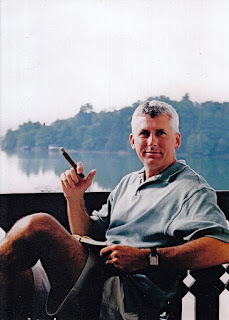 Eight days later, and ten years ago today, my dad passed away. I started my countdown of the 30 best players of my first 30 years as a baseball fan in early 2016. It became something of a boondoggle, because I didn't have as many personal stories relating to the players as I thought I would, and so few people were reading the entries that it became difficult to find the motivation to put real time and energy into them. I imagined writing two or three entries a week; instead by the second half of it I was writing only one a month. By the time I finished, 19 months had passed. 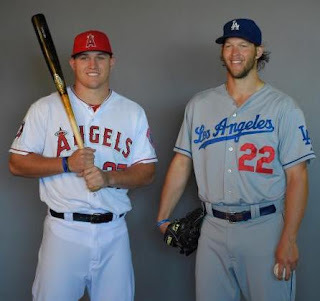 The list already felt a little off, so I've decided to redo the entire project, counting down the top 32 players of my first 32 years as a baseball fan. Just kidding, I'm never doing a project like this again. I am going to write this brief coda, to touch upon the changes brought by nearly two years passing between beginning and end. Even as an adult, much of life feels out of my control. A child's life is even more out of their hands. I didn't choose my family, I din't choose my home. I was incredibly fortunate in both of those regards. Others, through no fault of their own, are not. I did choose baseball, but I didn't choose to come of age during an era so many writers and fans would belatedly decide was bogus. For more than a decade now earlier generations have led a relentless effort to deny the beauty of the baseball I grew up with, but I say to hell with anyone who says the baseball I grew up wasn't as joyous as the baseball they grew up with, to hell with anyone who would put an asterisk next to any of it, to hell with anyone who would deny the transcendence of Barry Bonds. 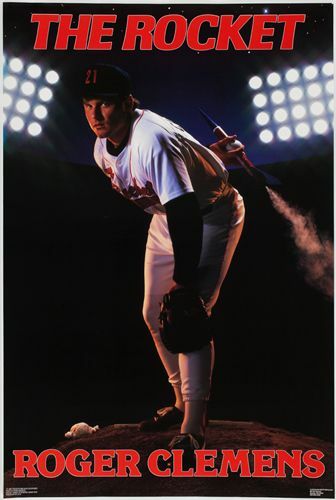 It's been more than two decades since Greg Maddux became my favorite pitcher and eventually my favorite player, but when I was younger it was Roger Clemens whose poster adorned my wall. He was on the mound, holding a baseball that was also a rocket, because that was his nickname. (Do they still make posters like that one, which were everywhere when I was young? If not, kids today are really missing out.) The poster must not have been officially licensed, because he wasn't wearing his Red Sox uniform. I'm not exactly sure what drew me to Clemens, but given that he won the Cy Young Award each of the first two years I was paying any attention to baseball, and he struck out a million guys, and had that cool nickname, it doesn't seem especially surprising. When I was 12 years old he appeared on The Simpsons as the pitcher for the team of ringers Mr. Burns put together for the big power plant softball game, which probably brought my Clemens fandom to its peak. The 25 years since then brought a gradual but precipitous decline of that fandom, eventually reaching a point where that Simpsons episode is about the only thing I still like about him. Still, the man could really pitch. Since I began this blog more than five years ago, I've gotten to write for and manage maybe the most substantial Cleveland Indians fan site on the internet, and to accept an award honoring Let' Go Tribe as Cleveland's best sports website. My name has appeared in Sports Illustrated and a number of newspapers, including the New York Times, and has been mentioned on Baseball Tonight and during a couple of MLB broadcasts. Probably none of that would have happened if while perusing the sports section on the morning of Monday, June 8, I hadn't decided to have a third bowl of cereal. During my first and second bowls, I'd been reading coverage of the previous day's NBA Finals game, in which the Bulls had obliterated the Jazz 96-54 (still the most lopsided Finals game in history), but by the third bowl of Peanut Butter Cap'n Crunch I had turned to the baseball page. My Indians had beaten the Reds 6-1, led by a strong outing from Dave Burba, who also became the first Tribe pitcher to hit a home run since before the designated hitter was introduced in 1973. I was checking other box scores when I saw that Greg Maddux had shut out the Orioles and thrown only 99 pitches. Randy Johnson's career path was unlike that of any other pitcher. Actually, that's not true, his path was like that of a few others, but his version of that path was a wildly exaggerated version, which is pretty apt for a man six feet and ten inches tall, who played much of his career with a mullet and a mustache, and who once accidentally killed a bird with a pitch. Johnson was a second-round pick by the Expos, and he soon showed why a team would select him so high in the draft, as he struck out ten guys for every nine innings he pitched during his first full season on the farm. The next year his strikeout rate climbed even higher, to 10.4 per 9 innings, but his walk rate was an unsightly 8.2 per 9 innings. That was the worst mark in the Southern League, but the allure of his strikeouts proved difficult to resist, and by the following September, Johnson had made his MLB debut with Montreal. Not long after that he was dealt to Seattle as part of the Mark Langston trade that highlighted the Expos' ill-fated postseason push in 1989. It was with the Mariners that he first made a name for himself, but greatness took a while. After graduating from college, I returned home for a few months until I could figure out the next step. Around the time I moved back in, a pair of cardinals built their nest in a bush in our backyard. Soon there was a pair of speckled eggs. Before long they hatched, and over the next couple weeks the babies went from hatchlings to fledglings. On Father's Day the two of them ventured from the nest for the first time, hopping around in the yard as their parents kept a watchful eye and did whatever it is birds might do to help their young. Dad and I stayed at a distance and watched as they flapped and flailed around on the ground, slowly showing signs of figuring out how to use their wings. In the middle of the afternoon a squirrel killed one of them. The mother and father moved closer to their surviving chick, the better to prevent a similar fate from befalling it. Dad and I got closer too, and a couple hours later we celebrated in the fading daylight when that little bird took proper flight. "Never feel sorry for a man who owns a plane." I don't know if Alex Rodriguez owns a plane or not, but he certainly could, having earned more than $400 million as a ballplayer, plus whatever endorsement money he collected over the years. He debuted at a very young age, was great almost immediately, and looked likely to challenge many of the most storied records in the game. What a weird, pathetic path his career eventually wandered though. I spent years strongly disliking him, rooting against him and the teams he played for, but by the end he'd been vilified beyond any reasonable measure, and if he weren't categorically disqualified from pity, I think I'd have felt sorry for Alex Rodriguez.